Love lemons. Love dogs. Look at how the camera peeks through the branches and leaves and finds the dog. Look at that lemon! Such joy! Sending a huge hug to Sam. Oh to live where lemon trees grow...and bloom...and ripen to beautiful yellow fruit. the relationship between these elements are beautiful & heartwarming. & i adore each element..my favorite dog, a fresh sunshine lemon, life against greens. a very lovely reflective moment. What a sweet portrait of Sam. Love the combination of Sam and the lemon tree! oh we haven't seen sam in a while!! I've missed Sam! It's great to see him with his tennis ball! 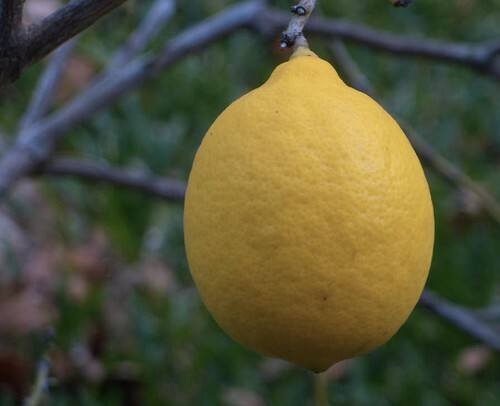 Wow, how cool to grow your own lemons. They are so expensive in the stores here. so much in thought. i can feel it. hugs to you. I love how you weave the two subjects together -- Sam and the lemon tree. We head to Texas in four weeks. Will I see a lemon tree then? Sam is beautiful gray hairs and all. 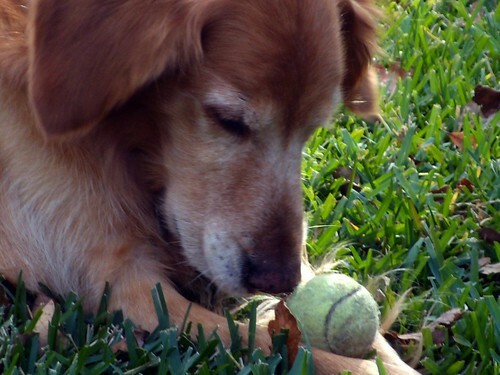 Isn't cute how even older dogs will love their ball like a puppy? i love the new banner - it looks like the hands of people of different cultures reaching out to each other. 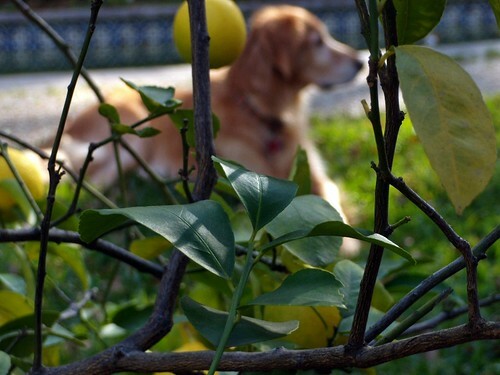 and love this post - i have been trying to convince katie the yard needs a lemon tree, but to no avail. and sam. how wonderful to have such a friend as he no doubt is. Nice sunny shots! love the lemon tree. this pairing, the lemons, Sam. I want a lemon tree in my yard! 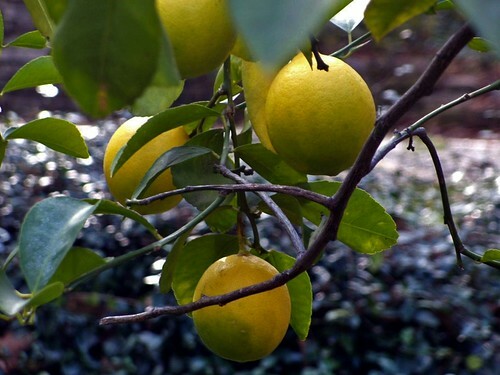 you have a lemon tree in your yard ? He's so sweet, thinking his own doggy thoughts, not knowing he's observed. I love goldens.